Nikon launched its full-frame mirrorless camera system in 2018, and with the arrival of the Z 6 and Z 7 came a new lens system using the Nikon Z mount. This mount was not directly compatible with the Nikon F mount which had been used, in different variations, on Nikon's SLRs and DSLRs since 1959. The new lens mount had a diameter of 55mm, making it 17% bigger than the F-mount - and with that came the promise of faster lenses than we had seen before. And the flange distance (the distance between the back of the lens and the sensor) was just 16mm – as there was no mirror to build into the light path. Building a new lens system from scratch takes time – so new zooms and primes using the Z mount are being gradually introduced by Nikon. 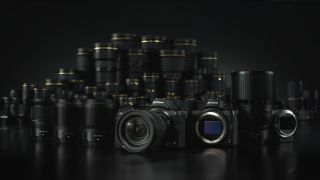 Three lenses were introduced with the Z7 and Z6 - but at launch the company presented a Nikon Z lens roadmap, which gave a view of the lenses it would introduce over the next year or two. This is the first zoom for the Nikon Z camera – and the one most commonly sold in kits if you buy a Z6 or Z7 body. This classic standard lens prime is remiscent of the lenses that many people got as their kit lens when they bought an SLR back in the 1960s and 70s. This was the first prime to be launched for the Z system of lenses. The first new Z mount lens to be launch in 2019, the 14-30mm is a super-wide-angle zoom - and uncharacteristically for a lens can be used with a front-mounted filter. This adaptor was available at launch of the Z7, and allows Nikon F mount lenses to be used with either the Z6 or Z7. A large number of Nikon lenses can work with the adaper, and many of the most recent ones will also allow autofocus (check the FTZ compatibility guide for full details). Probably the most anticipated lens on the Nikon Z lens roadmap... this monster prime lens has a phenomenal f/0.95 maximum aperture. We expect this Noct lens to weigh heavily on the arms and the pocket! This short telephoto has the wide aperture and focal length that is sought after by portrait photographers. When the 24mm and 85mm and launched, there will be four f/1.8 primes in the range. A must-have lens for any pro - this fast aperture tele zoom is an essential workhorse for weddings, news, and sports. A faster 50mm prime, that will be welcomed by documentary and street photographers. This will be the fifth f/1.8 prime in the range. This will complete the holy trinity of f/2.8 pro zooms for the Z system. We expect other manufacturers to start supporting the lens mount over the next year or two.